I have to be honest. I have learned so much in just a few days. I chat is fun and informative, and they welcome even the new guys with open arms. I look forward to learning a growing. 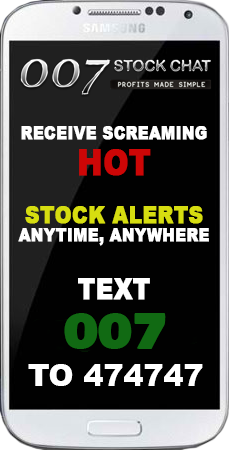 If your looking for a great place for learning how to trade stocks and getting in before the crowds, then 007stockchat is the place to be. Nothing better than being able to make friends and money at the same time. Joined 007 chat about a year ago. I love the folks in there. We are all business when need be, yet we also have a human side that we share as well. Good room picks for the most part, good member picks and alerts as well. Knowledgeable peeps are always will to assist. Come in and decide for yourself. Awesome site. Very educated people to help newbies. You guys rock. The chat is great, very focused and you get the most accurate alerts. No pumps. Great bunch of investors here. They are willing to answer questions and what I have found is ask the question and anything you don't know from the answer Google it, not because they don't know, because I want others to learn as well and have turns! Plus the chat is great, very focused on trading no BS. Very respectful bunch! This is awesome site and whole team of otcifre should be appreciated by creating such channel in which people make profits and earn about trading. Absolutely love this chat room. I'm a newbie in the trading world and am paper trading for now. Not only is this chat well monitored but they go out of their way to help you understand why they are trading or selling a particular stock. I look forward to learning something new every day. I consider some of this chat service to be my colleagues in this new and exciting world.